This morning I weighed myself. I realize I have to weigh myself constantly or I make bad choices. It's my little way of staying accountable. I've tried to immerse myself in fitness posts and blogs online. I've seen a lot of great ideas and I am looking forward to implementing them. Today my husband brought lunch home. I ate a salad! That's willpower, especially if you've ever had a Zaxby's large chicken finger plate, no slaw- all fries, extra zax sauce. But thanks to my WW app, I found out that its worth 48pts. Which is more than I'm allowed in a day and almost my full weekly cheat points!!! No thank you. Oh! I got sidetracked and forgot to say I was down 1.7lbs this morning (yay!). Also- I'm staying at my Mom's house part time and its been so hot that we didn't feel like cooking so I picked up a rotisserie chicken. Before I would look at it and think- that's it? I want to eat the whole thing. Today? I took more than I should but less than I used to take. Then? I threw a lot away. I'm making slow changes! I feel like I'm in AA or some other equivalent. And in a sense I guess I am. 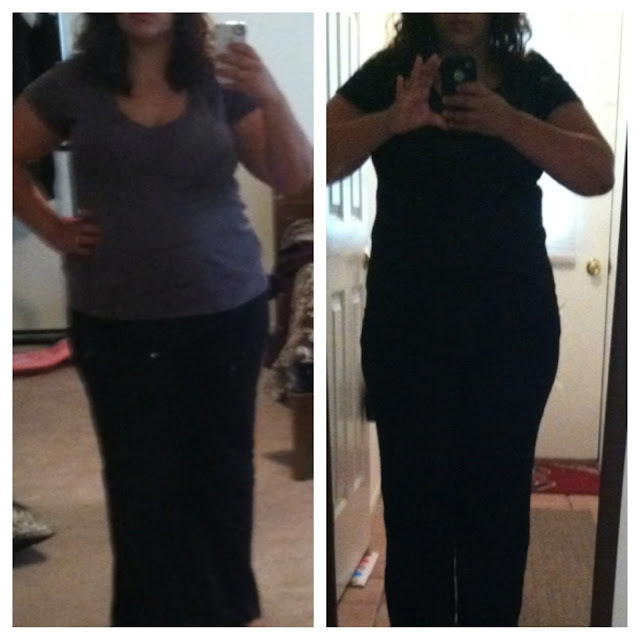 So I have about 17 days left of my 1st Body by Vi 90 Day Challenge. My plan is to really step it up these last days with exercise and hit the 20lbs down mark by day 90! 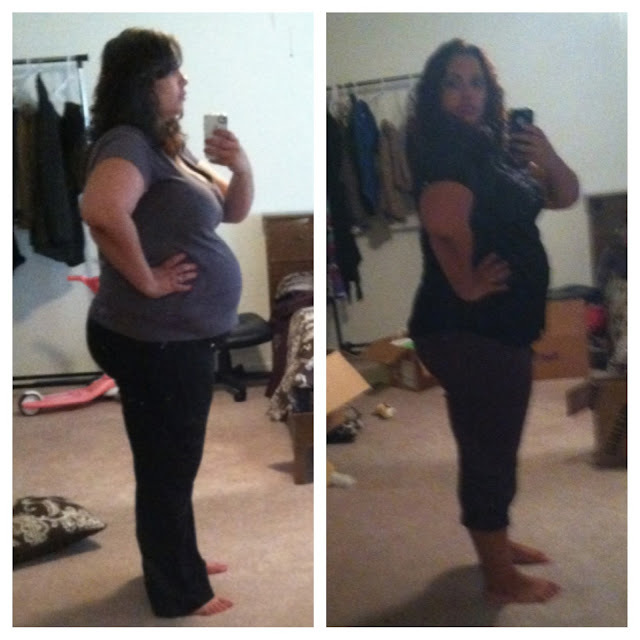 I took a couple of pics today just to visually see my progress- and they are posted below! I can't wait to post my final stats! When I was pregnant, I ate out a lot! I didn't just eat typical fast food- I would pick up to go orders at normal restaurants as well. I didn't over eat- in fact my husband mentioned that I ate less while pregnant. Boy were we wrong!!!! 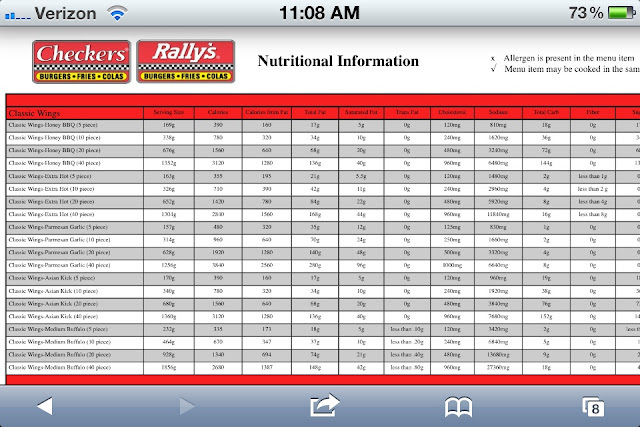 Two nights ago we started looking up nutritional information from many of our usual places. All I can say is WOW! I was seriously over eating as far as calories were concerned! A favorite of our's when we were visiting in SC would be Zaxby's. We would make a point to eat it 2-3 times each visit because we don't have one near us in MD. My normal meal would be the Chicken Finger Plate, no slaw, extra fries, extra Zax Sauce. Can you guess how many calories that 1 meal is? My Husby and I almost had a heart attack when we read that! 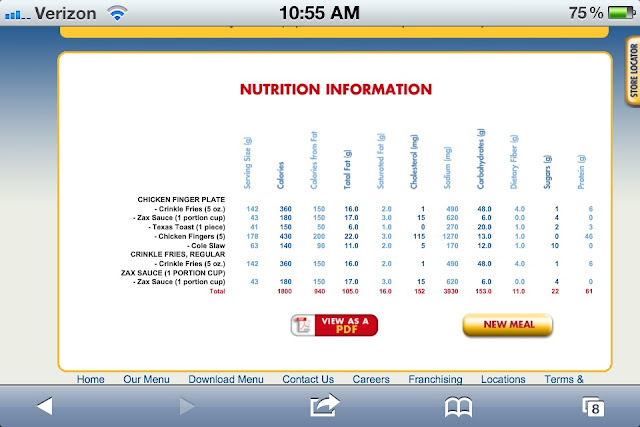 One small Zax Sauce alone has 180 calories in it!!! I would use 2! That one meal alone has more calories in it than I aim for in an entire day! There is one other place I wanna mention. Checkers. For many months during my pregnancy and right after as well, Checkers offered 20 wings for 9.99. We would typically buy 2 (that's right 40 wings). Usually because we both wanted a different flavor (garlic parmesan for me and BBQ for him). I guess I always assumed and rationalized that since we were only eating wings it wasn't that bad. 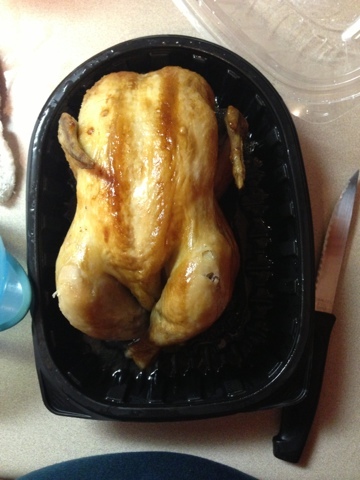 I mean it's just chicken, right? Wrong! The BBQ wings (20 pc) have 1560 calories!!!! You think that's bad? Those garlic parmesan wings I loved inhaling? One thousand nine hundred and twenty calories! 1-9-2-0! Combine the 2 together and that is 3500 calories!! Another helpful tool, I'd like to encourage you to use is the My Fitness Pal app! It's an easy was to keep up with your calories throughout the day and it has thousands of fast food and restaurant meals listed. I use it now to help me see that the choices I make when going out to eat can be healthy- if I know what to order! I long to be in Onederland (and I hate admitting to the whole world that I am not in Onederland). Truth is, I haven't been in Onederland in years- probably before Bella was conceived. (early 2007). 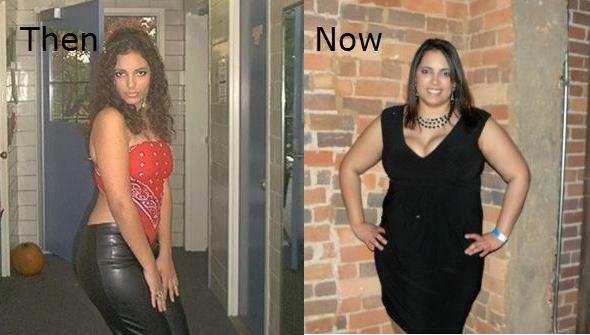 I got real close in 2009 when I did Jenny Craig. My smallest was 207. I'm currently battling the bulge and slowly ticking away at the pounds. Before I went on vacation I had lost 14lbs. Sadly I only stuck to my diet less than 1/2 the time at the beach so I gained about 3lbs. But I am back at it and have already lost 1 of those lbs! I had a glamorous goal of losing 45lbs on my first 90 day challenge and now with only about 25 days left- I will settle for 20lbs! I plan on doing a second 90 day challenge and make that goal 25lbs! I hope to be in Onederland by Christmas! And then by my 30th birthday in May, I hope to get to 175. And finally, thank you to all my readers! I know I haven't posted as regularly as I used to but when I do, your feedback keeps me going!